"This short, rhyming tale by David Small deals with the farm animals owned by George Washington. 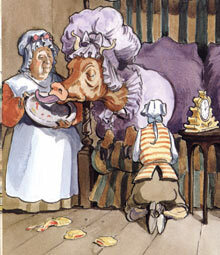 Guaranteed to stretch the imagination while tickling the funny bone, it is a tale of cows who must be pampered with silk clothes and soft talk in order to produce milk, genteel pigs who are handy around the house and dinner table, and sheep who impress everyone with their knowledge. Narrator Peter Fernandez does a fine job of reading with a deadpan expression-adding to the credibility of the story. Delightful period music weaves in and out at appropriate times and is never distracting. Sound effects such as cows walking upstairs, animal noises, water bubbling, and hands applauding emphasize the action. Page turn signals on one side of the tape are the sounds of a page turning. Add this one to your list of tall tales for a very moo-ving experience!"